Your average pedometer is a device that counts the number of steps you take by detecting motion in your arms and legs. Traditionally, pedometers required manual calibration for representation of data in the desired unit – miles or kilometers. Thankfully technology isn’t far behind, and now we have apps and automated electronic devices to do the math! Your pedometer is your best friend when it comes to motivating you to shed off those extra pounds. Android integrated the step counter with its 4.4 version (KitKat). It uses the phone's Geo-sensor to count the steps take and converts the data into the distance traveled. A good app will not only count your steps but also motivate you to do more to achieve your daily walking goals. They can be a useful and perfect companion to improve your fitness in a more convenient way. Also known as ‘Map My Walk’, this is one of the best pedometer apps on Android. It counts your steps and monitors your movement. This app provides the perfect companion for your running experience. It tracks and records your progress on Map. An interesting feature is that it uploads data on its official website MapMyWalk.com where you can view your activities in detail. Set your running goals and it will plan out your daily routine for you. Apart from this, it has GPS tracking, workout monitoring, and calorie counting and keeps track of what you eat. Give it a try to find a whole new workout buddy! 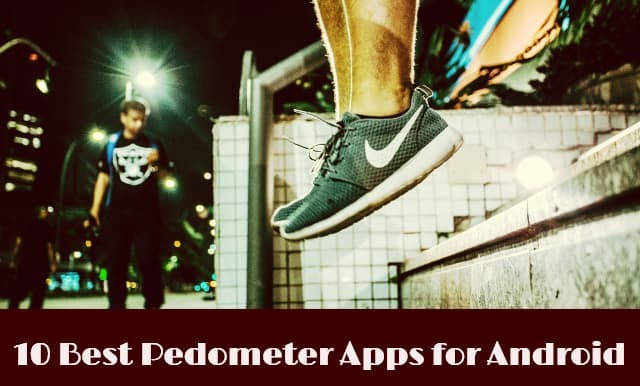 This accurate pedometer app will monitor your daily walking, running or other fitness activities. It keeps track of everything from your step count to your calories and routes on the map. Accupedo includes a 3D motion recognition algorithm that counts your steps by recognizing your walking patterns. It has a power saving mode so that you can use it all day. It stores your daily fitness activities in a history log and provides an easy way to read data. No matter where you keep your phone, this app finds a way to work accurately. It is another popular free fitness app for Android that works as an efficient pedometer. Fitbit can be used while running, walking, hiking and keeps logs of your daily activities, providing a better way to manage your fitness in a smart way. Set whatever goals you want – daily, weekly or monthly - and keep track of its progress! This app can also track your heart rate and the calories you burn every day. You can sync it with some Fitbit compatible devices and be on your way to fitness. Runtastic Pedometer is an excellent pedometer app that provides all the essential features along with speed calculation and integration to all the popular social media websites. You can now share your walking routine with your friends for motivation and competition! This app will challenge you to walk 10,000 steps every day, which will only force you to take the stairs rather than choosing the elevator to reach your daily goals. Endomodo will track your steps, your heart beat and your workout duration in one application. The best part? It provides you audio feedback and encouragement in real time. You can share your training details and motivate others too. It’s like Twitter, but for jogging! There’s also an array of other activities that you can choose from – walking, running, cycling to Pilates, yoga and martial arts. Ever abandoned your workout schedules because you got bored of your routine? Well here’s the app that will prevent that from happening again! Can you imagine running away from a zombie apocalypse to safety while mapping your path? This app submerges you in its audiovisual thrill and forces you to run with all the adrenaline that your body has to offer. Think of the monstrous sounds of zombies appearing whenever you slow down. It’s a fun way to make sure you run. And run fast! It is yet another free pedometer app for Android that tracks your every step. It records any walking, running, cycling and other physical activity. Easy to us and with a clean user interface, Moves keeps track of your distance traveled on a map with the number of steps taken, the time taken to travel that distance and the calories you burnt during the activity. Once turned on, it stays ON, and you don’t need to keep checking it. It consumes some battery though, but that’s what you will have to pay for the utilities it offers. Noom Walk is your effective step counter as it actively counts your steps all day long. It integrates with the Noom Personal Coach dashboard where the data you submit is stored automatically. Unlike any other app that keeps running in the background, Noom Walk claims to be power efficient. You can choose whatever fitness program you like. It comes divided into three stages – Learning, Practicing and Mastery. Give Noom Walk a try. You won’t regret it. It is one of the most efficient running apps for Android. Aimed at helping you improve your fitness it tracks your running, walking, cycling and any other fitness activity using the phone’s GPS. It even calculates the pace of your running, the distance you traveled and the calories you're burning during that time. Runkeeper integrates with your music app to provide better music experience while running. You can set your goals, track your progress and share your achievements on any social platform. Now that’s a pretty handy bargain. Nike, of course, is your number one sports brand. The app is for the serious runner. The Nike+ Running app shows you a detailed breakdown of every run and even uploads it to NikePlus.com. You can enable live audio cheers if you choose to broadcast the start of your run to friends on Facebook and even show off your route with the map sharing experience. If you have fixed fitness goals, this is the app for you.